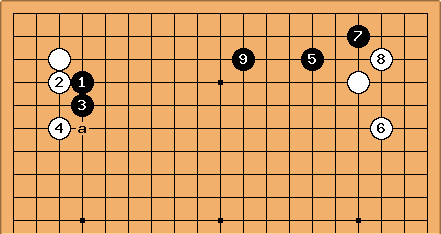 White may ignore in this position after the 3-3 point shoulder hit: White shouldn't play tenuki earlier, but Black has played on the second line and this could be a good moment. 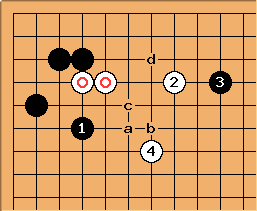 This plan was played a number of times by Go Seigen. Usually Black attacks with and . 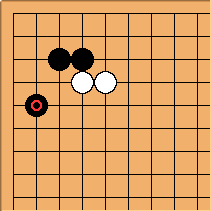 Then is the Go Seigen choice of haengma, treating the stones lightly (Black a, White b, Black c, White d can occur). This is from Rin Kaiho-Kato Masao (B) 1977-08-11, with colours reversed. The solid play with took territory along the left side, in this case. 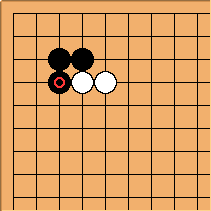 If Black plays in this way, White seems rarely to play tenuki, in pro games. This is from Hu Yaoyu-Yi Ch'ang-ho (B) 2003-01-22. After White is threatening to play at a. 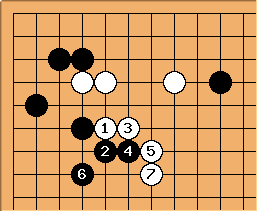 Black however plays tenuki; and after has created a strong group to minimise what White can do on the left.